PRINCETON, NJ -- More than four in 10 Americans continue to believe that God created humans in their present form 10,000 years ago, a view that has changed little over the past three decades. Half of Americans believe humans evolved, with the majority of these saying God guided the evolutionary process. However, the percentage who say God was not involved is rising. This latest update is from Gallup's Values and Beliefs survey conducted May 8-11. Gallup first asked the three-part question about human origins in 1982. The percentage of the U.S. population choosing the creationist perspective as closest to their own view has fluctuated in a narrow range between 40% and 47% since the question's inception. There is little indication of a sustained downward trend in the proportion of the U.S. population who hold a creationist view of human origins. At the same time, the percentage of Americans who adhere to a strict secularist viewpoint -- that humans evolved over time, with God having no part in this process -- has doubled since 1999. Historically, Americans' views on the origin of humans have been related to their religiousness, education, and age. Religiousness relates most strongly to these views, which is not surprising, given that this question deals directly with God's role in human origins. The percentage of Americans who accept the creationist viewpoint ranges from 69% among those who attend religious services weekly to 23% among those who seldom or never attend. Educational attainment is also related to these attitudes, with belief in the creationist perspective dropping from 57% among Americans with no more than a high school education to less than half that (27%) among those with a college degree. Those with college degrees are, accordingly, much more likely to choose one of the two evolutionary explanations. Younger Americans -- who are typically less religious than their elders -- are less likely to choose the creationist perspective than are older Americans. Americans aged 65 and older -- the most religious of any age group -- are most likely to choose the creationist perspective. Americans' self-reported familiarity with evolution as an explanation for the origin and development of life on Earth has stayed roughly the same over the past seven years. Seventy-nine percent of Americans say they are very or somewhat familiar with it, leaving 19% not too or not at all familiar. However, significantly fewer Americans claim familiarity with "creationism" than did so seven years ago. In 2007, 86% were familiar, including 50% who were very familiar. Now, 76% are familiar, with just 38% very familiar. In short, even though the adherence to the creationist view has not changed over time, familiarity with the term "creationism" has diminished. Sixty-four percent of those who are very familiar with the theory of evolution choose one of the two evolutionary explanations for the origin of humans, compared with 28% among the smaller group of Americans who report being not too or not at all familiar with it. The majority of those not familiar with evolution choose the creationist viewpoint. These relationships do not necessarily prove that if Americans were to learn more about evolution they would be more likely to believe in it. Those with less education are most likely to espouse the creationist view and to be least familiar with evolution, but it's not clear that gaining more education per se would shift their perspectives. Many religious Americans accept creationism mostly on the basis of their religious convictions. Whether their beliefs would change if they became more familiar with evolution is an open question. 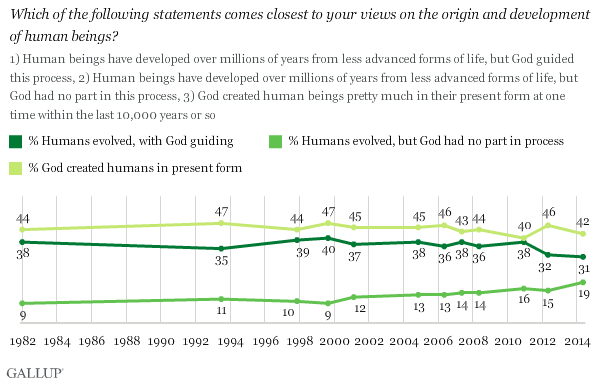 Between 40% and 47% of Americans over the past 32 years have said the creationist explanation for the origin of human life best fits their personal views. These Americans tend to be highly religious, underscoring the degree to which many Americans view the world around them through the lens of their religious beliefs. Those who adopt the creationist view also tend to have lower education levels, but given the strong influence of religious beliefs, it is not clear to what degree having more education or different types of education might affect their views. A number of states have been embroiled in fights in recent years over the degree to which evolution and creationism should be included in their public school curricula. Residents in the South are more likely to believe in the creationist view of the origin of humans than are those living in other regions, making it clear why the fights to have creationism addressed in the public schools might be an important political issue in that region. Still, few scientists would agree that humans were created pretty much in their present form at one time 10,000 years ago, underscoring the ongoing discontinuity between the beliefs that many Americans hold and the general scientific consensus on this important issue. Four in 10 Americans, slightly fewer today than in years past, believe God created humans as is about 10,000 years ago. A similar number (38%) believe God guided the development of humans from less advanced life forms over millions of years, while 16% believe humans evolved without God's involvement.